On Lay Ministry and Discipleship: Are You a Dedicated Player? God gives His Spirit to every true believer in Jesus Christ, and this Spirit gives each one gifts for ministry. Therefore, every believer can perform the ministry of the Church by using his or her individual gifts from God. Unfortunately, it is also true that when we say ministry of the church, it means mainly the ministry of the pastor. In many cases, laity is described as the flock and the pastor as shepherd, and thus laity is the object of ministry. However, as we already know, historically, the early Christian Church began its course through the witness and activity of “common” people. The Bible witnesses to us not about the offices, ordination, and hierarchy, but the function, calling, and vocation of those called to minister to people within the church, and evangelize to those outside (see Eph.4:11). I strongly believe that God’s ministry cannot be fulfilled by only focusing on the ministry of the pastor. Every individual in the church is called by God, not only to be God’s chosen, but also to participate in God’s mission and ministry. Both clergy and laity are all equally important in the body of Christ, serving God and the world. Many Christians are still reluctant to let go of the notion of “the clergy doing the pastoring and the laity just receiving it.” This might be a reason why churches today are shrinking and not able to grow. Perhaps this is also why Lincoln Park is struggling, as well. The lack of lay ministry and the failure to make disciples in local churches are not minor issues, but dangerous problems that threaten the Church itself. Both clergy and laity are called upon to collaborate as co-workers. Even better, laity-led ministry can stimulate Church growth by opening the way for all members of the Church to participate in God’s holistic ministry. Thankfully, Lincoln Park has compassion, will, able leaders, and so much potential for lay ministry. Many good administrative lay leaders already serve in various committees. But that’s not enough. If Lincoln Park truly wants to grow in quality and quantity, we need more steady and strong spiritual lay leadership. We need more laity who can lead prayer meetings, teach Bible study, become actively involved in youth ministry, plan and go on mission trips, serve as Sunday school teachers, and step up as lay speakers. 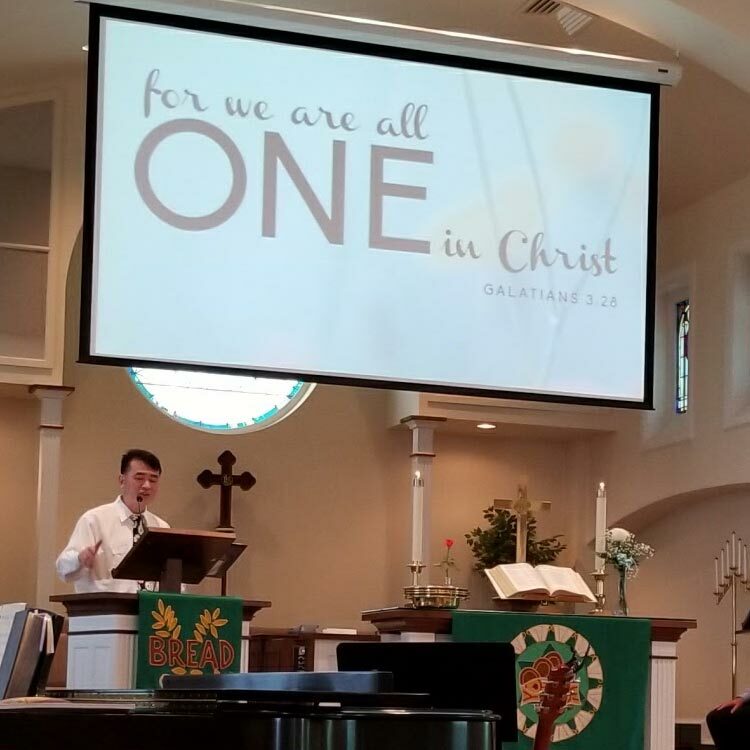 Pastor SunAe and I will continually ask and encourage you to teach, preach, or participate in various church ministry and mission opportunities. This is an intentional part our ministry plan to make each and every one of us disciples of Jesus Christ, not just a pew-warmer or spectator. I love football. In my observation, there are three kinds of people that enjoy football. One type is a TV audience member who watches the game from the living room as a hobby. Even though they have their favorite teams and are eager to watch, they are not committed enough to go to the games. The other is the spectator in the stadium who shows up, wears team jerseys, spends time and money, and roots for his/her team, but is not a player. The third is the actual player on the field who plays each game with all their strength, skills, and commitment to win. Such is the same with Christian faith. Many just know about Jesus Christ and are satisfied with being a good neighbor of church. They show up to church during special seasons like Christmas or Easter. Some go to church on a regular basis and have been longtime members, but they are more like the audience of a stadium. They sit on the pews and enjoy watching the pastor or a few laity work. Very few are real disciples of Jesus who show their commitment and do their own ministry, not only in the church, but also in their family, work place, and community. When we identify ourselves as Christ-followers (Christians), we follow Christ’s footsteps. In Christ, with Christ, through Christ, we not only receive God’s love but also are empowered to live like Christ, imitating the love of Christ. In fact, the Bible teaches us that love is to be our clothing (Gal. 3:27). One of the many aspects of love is binding the broken. The most sublime and perfect example of the love of Christ can be understood as a reconciliation, for Jesus Christ came to us to be the bridge builder (Mediator) between God and us (1 Tim. 2:5). In this sense, Christian love is a binding love; binding the broken in the name of Christ through the grace of God. On the contrary, breaking divisiveness in the name of self-centered myopia is not of God. The Hebrew word Satan means adversary, and its translation to Greek gives us the word Diabolos, from the root dia-ballo, “to divide or separate.” Hence, the meaning of Devil (Diabolos) is “He who places division,” and its derived meaning is “slanderer.” Accordingly, someone who causes divisions and has no love that the Bible speaks of; someone who divides or stirs up divisions in the church is not from God either. Love is the antidote against the work of the devil who divides. When we prevent any enemy’s scheme of breaking our unity through seemingly valid claims (some truth, but without love), our weapon is the love that binds. Through Paul’s exhortation that we clothe ourselves with love that binds, we are given the right way to fight spiritual battles against our enemy. Compassion, kindness, humility, meekness, patience, and forgiveness (Col. 3:12; 1 Cor. 3:4-7) are not just different names of love, but of spiritual armor. If we witness that one of us follows the enemy’s scheme and plants an idea of division among us, over different worship styles for example, we need to wear the spiritual armor of compassion against the hurting spirit, kindness against the blaming spirit, humility against the judging spirit, meekness against the egoistic spirit, patience against the upsetting spirit, forgiveness against the angry spirit… with such spiritual armor, we can beat the dividing spirit in the church/among us. “Do not be overcome by evil, but overcome evil with good” (Rom. 12:21). No one can perfectly describe a Christ bearer’s life, but anyone can discern what is not the life of a Christ bearer. We, as bearers of Christ’s love, are the witnesses and recipients of God’s gift: Christ who is love. So when we are clothed with love, possessing the different virtues of Christ’s character, we become a small gift to others from God. The characteristic of Christian life is to become a gift. Unlike worldly material gifts that can be sent forward to someone unused, God’s gift can be sent forward only when we are used. If we are not given to other people like Christ was given to us, then we are meaningless gifts. Think of gifts on the shelf of a gift shop! If it isn’t purchased and given to a special recipient, then it is not a gift, but a mere decoration. A gift is to be given. We, as Christians who have received God’s gift of salvation, the gift of love, should give it to others, rather than leaving it on a dusty shelf. If I call myself a Christian and go to church every Sunday, but no one around me feels any binding love through compassion, kindness, humility, patience, and forgiving spirit, then I am a self-defined gift kept on a shelf; I am but a decoration. If any of us feels like a decoration, it is time to wear love and live in Christlikeness. If we want to wear these spiritual clothes of love that binds, we have to take off clothes of contention, hatred, short temper, resentment, and unforgivingness. If we cannot take these off all at once, at least we can will. We need to will, because whatever divides and separates us from one another is not of God, but of the devil. Previously, we may have lived indifferently. However, here and now as we open another calendar year, we need to decide which clothes we want to and will intentionally wear. Would you join me a word of prayer? Let us bow our heads. Let us take a moment for silent prayer! These are the words we most frequently say or hear during church services. As Christians, we not only worship God every Sunday, but we also participate in fellowship activities, attend Bible studies, and join in various mission and ministry opportunities. Before, during, and after such worship, activities, or events, we always pray. Why do we pray? Why should we pray? Who should pray? Every time we do God’s ministry or attend any meeting, fellowship event, or Christian education opportunity, we expect God’s intervention, guidance, protection, and provision. Unlike other social groups, we are looking beyond what we do. We expect God’s presence and the power of the Holy Spirit. For that reason, we pray and believe in the power of prayer. If we don’t believe in God’s presence and work, we don’t need to pray. But we do believe in God and His presence, power, and provision; so we need to pray before, during, and after whatever we do in the name of God. Prayer is not a ritual like the national anthem before a ball game. Prayer is asking for God’s help as we carry out His mission and ministry. The first thing I do every time I enter the church is pray. Before I meet or share anything with people, I meet God first. I intentionally take time to personally talk to and hear from God first. As a spiritual leader, I ask God to lead me, guide me, and give me whatever I need to further His kingdom. We need that act of faith, too. So, I suggest that you not only pray before a meal or bedtime, but also try to pray first thing when you come to church. Before you share a greeting or have fellowship with others, meet God first and take time to talk to God. Although I am still new to Lincoln Park, I am leading worship, attending committees, and participating in breakfasts, luncheons, and other fellowship events enough to share my observations with you. Because I am new, I can see things you may have become accustomed to, ignored, or don’t recognize. With respect to prayer, I was surprised by the culture that Lincoln Park is much too dependent on the pastor. The majority at Lincoln Park seems to perceive the pastor as the one in charge of every prayer. Surely, the pastor should be a person of prayer in his/her own journey of faith and should guide others to pray; however, it is a misunderstanding that the pastor is the only one who can or should pray at every meeting, event, or fellowship. The pastor’s exclusive duty and role for the church is Word and Sacrament. Prayer is not in that category. One of the biggest differences between Catholic and Protestant churches is the “priesthood of all believers.” We don’t need a priest to act as an agent when we confess and talk to God. The pastor is not a mediator between God and you; God desires to communicate with you personally, so you can talk to God anytime, anyplace, and on any occasion. I came here not as a professional praying person, but as a helper who can shepherd Lincoln Park to become a praying congregation. Remember, Jesus did not teach us how to preach, but how to pray. My suggestion for you is that you try to lead a prayer, especially if you are a chairperson of a committee or a leader at any gathering. If it is new and hard for you, write down your prayer. If you’re asked to lead and pray for the group, do not fear or turn it down. Our church staff and praise band team have begun to pray together before services every Sunday. We need to encourage and support each other, be one body of Christ, and ask for God’s help before we worship His name and glory. For Christians, whether clergy or laity, prayer is our major source of spiritual power and the proof of our intimate relationship with God. Each time my family packed boxes for a new appointment, I thought of one of the most faithful men in the Bible – Abraham. It was not because I could identify with his illustrious faith in God, but because I visualized, with great envy, his journey of leaving behind everything familiar for the unknown where God led him. Thus, it’s been a habit of mine to ponder what Abraham might have been thinking when God called him to leave without a map or knowledge of where exactly to go. This summer has been a season of transitions for the Koo family: packing and moving from the loving communities of faith in Maryland and Delaware where KyungMo and I served; moving to a new congregation, a different state, and a new Conference as co-pastors; sending away our son, Justin, to USMA in West Point, NY; learning new worship styles and hymns; unpacking and settling in to a new neighborhood in Berks County. Yet, this transition, filled with mixed emotions, has been a constant reminder of God’s guiding presence in our lives. We have been blessed by you all throughout this transition. We didn’t know we would meet such a welcoming congregation in Reading, PA. We never expected to be blessed by the open minds and understanding “ears” of the Lincoln Park people. I had no idea KyungMo would be received as an exciting preacher. The divine blessings upon our journey have become clearer and surer since we began personal visitations. We have visited about 50 individuals with (and without) their families in the past six weeks. As we have gotten to know your faces and names, listened to your life journeys, and prayed with you when we meet, KyungMo and I feel that God has led us here to serve God and the people of God with you at Lincoln Park. Beyond our expectations, our good God’s love, shining through your welcoming faces, has touched KyungMo and me deeply. Hence, we come to depend on God, seeking His will for every step of our journey with you at Lincoln Park. It is our prayer that whenever we come into the sanctuary to pray for the church, our vision will be fully aligned with God’s best will for Lincoln Park. It makes me think about how Abraham must have communicated with God throughout countless transitions in his journey: prayer. He must’ve been so intimate with God to be certain that he was going where God wanted him to be. The one certainty in the midst of Abraham’s journey and his courage to move forward into the unknown was God. Accordingly, it was God who was the center of Abraham’s thoughts and the anchor of his journey toward God’s promised land. In sharing with you parts of my family’s transition, I imagine that some of our Lincoln Park members might go through a season of transition, if not already; you or someone around you might move jobs, move homes, begin a new journey, find a new vocation, lose a loved one, welcome a birth, meet God anew… As my family and I have been blessed by you in our transitions, I hope your transition may also be led by divine guidance and blessed by people like you. I hope you can be sensitive and aware of the blessed presence of the living God through prayer. I hope you and I can join in prayer, in our small daily, seasonal, and life-changing transitions, so that we can journey to where God wants each of us to be with confidence in God, with anticipation in God, and with a deepened relationship with God. SunAe and I were so surprised by the hard work and dedication that the congregation was willing to invest for new pastors that many of them had yet to meet. I greet the Lincoln Park family in the name of Jesus Christ, our Lord and Savior. I thank God for giving SunAe and me the opportunity to serve God with Lincoln Park. First of all, I want to express my gratitude to some of you whom I met during the transition period. I thank the SPRC members for their warm welcome. You opened your hearts and embraced SunAe and me at our first interview. It was a heart-warming and encouraging meeting. Dan Christopher, the Chair, kindly guided us in our first steps through a series of conversations, emails, and phone calls. Meeting Beverly Perella, the Music Director, was another inspirational experience. She explained in detail the Worship and Music Ministry, followed by a touching piece on the organ. It was a refreshing and rejuvenating moment for my soul. Under the leadership of the Trustee’s Chair, Todd Beamesderfer, more than 20 volunteers came to the parsonage and did an Extreme Home Makeover. SunAe and I were so surprised by the hard work and dedication that the congregation was willing to invest for new pastors that many of them had yet to meet. We truly felt loved by Lincoln Park. Thank you for your warm welcome and hospitality. I already feel at home with old friends. Lincoln Park has many strengths for mission and ministry. Now we are adding one more characteristic: we have become a cross-cultural/racial congregation. Not only do we have some congregants from different cultures, but we now have a Korean pastor! This is a new experience for Lincoln Park, and there will certainly be some concerns and challenges along the way, but I believe it will be a unique and blessed journey of faith for us all. I want to share what cross-cultural/racial ministry means and also tell you more about my cultural and religious background. Ever since the Korean Methodist Church came into being (as a direct result of The United Methodist mission work 132 years ago) it has become the fastest growing Christian country in the world. According to the 2005 South Korean Census, Christians accounted for 25% of the population. Now, Korea has become the second largest Methodist community in the world. According to Christianity Today (March 2006), South Korean Churches have sent almost 13,000 long-term missionaries all over the world, which means that they are ranked second after the US. After the U.S. immigration policy change in 1965, which was favorable to immigration from Asian countries, a steady flow of Korean immigrants began to arrive in America every year. This brought about phenomenal growth and development of Korean ethnic churches in the U.S. There is a Korean joke, “When the Chinese immigrate to a country, they open a restaurant; when the Japanese immigrate to a country, they establish a company; when Koreans immigrate to a country, they build a church.” Currently, there are about 600 Korean UMCs in U.S. and about 150 Korean pastors, like me, who serve in cross-cultural/racial ministry in The United Methodist Church. As a result, in The United Methodist Church, Koreans are the second largest ethnic minority group, right after the African-American church. The Church’s affirmation of diversity is grounded in the biblical witness; that God uses people to witness across racial, national, and cultural boundaries. The experience of cross-cultural/racial ministry testifies to the Gospel and God’s mission, which are not locked within any one culture or nation. I come from a different culture, and have various, unique experiences to share with and witness to you. The presence of a Korean pastor can be viewed as both a destabilizing force and a source of creativity. However, I strongly believe that our cultural and racial differences will enrich our understanding of the Bible and expand our perspectives of the global nature of Good News of the Gospel. Under the context of our cross-cultural/racial ministry in Lincoln Park, we will learn, be challenged, develop, and help each other mature through a unique fellowship and spirituality in Christ.